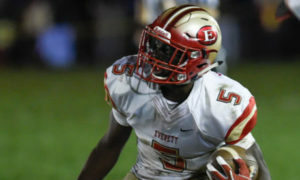 Buford (GA) Buford running back Christian Turner committed to Michigan on Monday afternoon. He chose the Wolverines over offers from Louisville, Miami, Michigan State, Nebraska, Notre Dame, and Wisconsin, among others. Turner stands 5’11” and weighs 187 lbs. 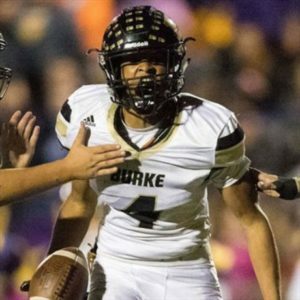 As a junior in 2016, he carried the ball 100 times for 1,100 yards and 18 touchdowns. He ran 82 times for 789 yards and 9 touchdowns as a sophomore. Hit the jump for my thoughts on Turner. Michigan’s recruitment of Turner has been relatively swift, though not lightning quick. 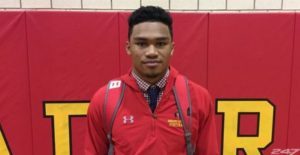 The Wolverines offered in late February, and he took an unofficial visit to Ann Arbor this past weekend. He also visited Notre Dame on the midwest swing, and rumors came out of it that he had silently committed to the Fighting Irish. However, just after visiting South Bend, the Wolverines won him over. He privately pledged to the coaching staff while taking another couple days to make it public. Turner is a nice little piece of the 2018 class. I think he’s a well rounded back, and I generally like running backs to be in that 5’11” range. 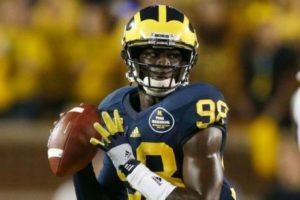 He plays in a pro-style offense similar to what he’ll see in Ann Arbor, so the footwork and reads should be fairly similar. He runs a lot of inside zone, outside zone, and power. Turner gets downhill quickly, keeps his shoulder pads square to the line of scrimmage, and runs behind his pads when necessary. The vision is there to plow straight ahead or see the cutback lane, and he has quick enough feet in the hole to take his body where his mind goes. He’s tricky enough in the open field to keep defenders guessing about whether he’ll cut back, power through a tackle, or try to turn on the jets. One thing (or two) lacking from his highlights is his play in the passing game; there’s no indication of whether he can catch the ball out of the backfield or pass block. He runs hard through contact, but he’s a little bit light and needs to gain strength in the lower body, so pass blocking may be an issue, at least early in his career. He also seems to lack that extra gear of speed; he’s more quick than fast. Overall, he’s not a game-changer, but he’s a solid complementary back. I don’t think he’s quite as shifty, but he reminds me of Fitzgerald Toussaint with his size, running style, and overall athleticism. 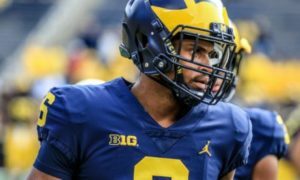 Toussaint had a solid Michigan career – whenever the offensive line wasn’t terrible – and has hung around as a backup in the NFL. I think ESPN and Rivals have him ranked generally in the right area, and while Scout is one of the better recruiting sites, I disagree with having him ranked as the #72 overall back. 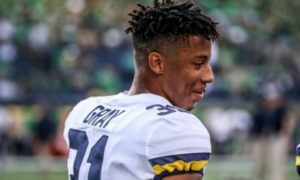 Michigan now has five committed players in the 2018 class, three of whom are from Georgia (Turner, CB Myles Sims, and S/LB Otis Reese). 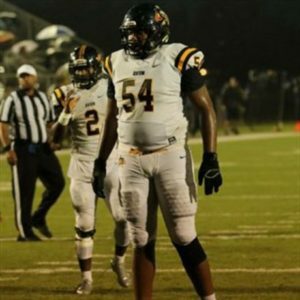 They join DT Aubrey Solomon and RB Kurt Taylor from the 2017 class as Peach State natives, and Michigan seems to be making inroads in a very talented state. 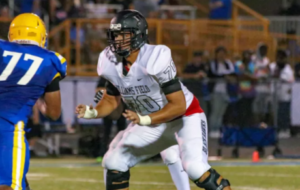 Aside from the traditionally powerful football programs in California, Florida, and Texas – states that are talked about constantly – I have to say that I have found the talent in Georgia to be tantalizing. Buford High School is a powerhouse program in one of the middle classifications of Georgia, with just over 1,100 students. They consistently push out talent, and they have won seven state championships in the last decade. Michigan has not traditionally recruited Georgia well, but Buford would be a great place to get a toehold. 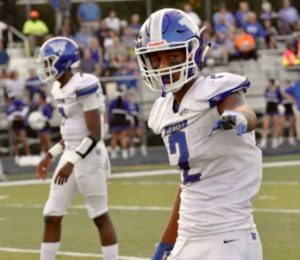 Michigan has roughly ten spots open in the 2018 class (LINK), though that number will obviously increase with early departures of various kinds. 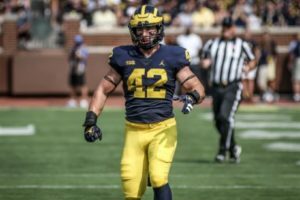 I expect the Wolverines to continue pursuing elite running back options, but after taking two in 2017, they don’t need to reach for another prospect at the position. Sorry, but this is another “why this guy, and why now?” offer. We may only take one RB in this class, so why wouldn’t we be looking for someone who has the talent to be a starter and a #1 back? This guy will still be available in 6 months or more, so why jump the gun? Is he really the best RB prospect that we’re going to have a good shot at in the whole recruiting cycle? if we want to be an elite program, we can’t be settling for guys at this level almost a year before Signing Day, all the “I trust the coaches” and “Yeah, but…but…Mike Hart..3 stars rock!” apologetics notwithstanding. I guarantee that the teams we’re competing against will do better. The teams we’ll be competing against include Notre Dame and Wisconsin, for example, both of whom offered him. And no, he wouldn’t be available in six months – he was about to commit to Notre Dame. 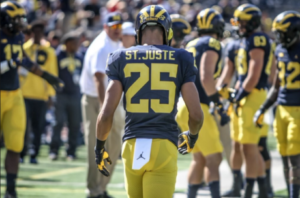 Did you complain about St. Juste when he committed because he was a no name 3 star from Canada? Rankings change. Kids from small schools go to the big camps and prove themselves. Which is what Turner will have to do. Better to get in on a guy too early than too late. If you look at the offer board theres 9 uncommitted rbs, and 5 are ranked higher on the composite, none with a single UM crystal ball. Not exactly a ton of options. Especially if we plan on taking 2. Maybe the coaches aren’t getting positive vibes from the other rb recruits. Sure they can keep contacting them and hope for a flip of one of the top guys, but I don’t think the attitude should be 5 stars or no one. Like clockwork, WindyCityDouche shows up after we get a 3-star so he can crap on the kid and the coaches. 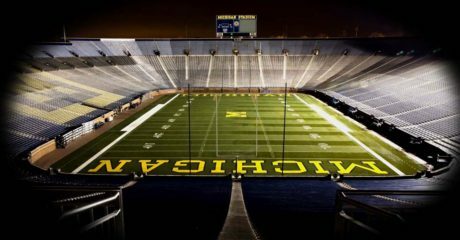 The guy is no where to be found after we get an Aubrey Solomon, Rashan Gary, Peoples-Jones, Ambry Thomas, etc. Our expectations are to be at a level above both of those teams. We want to be competing at the level of Ohio State, Clemson and Alabama. Would you agree or not? Ohio State already has two more highly rated RBs in their 2018 class. They beat us last year because they had a Curtis Samuel, and we had a Deveon Smith. So again, why are we settling? Do we want that cycle to continue? 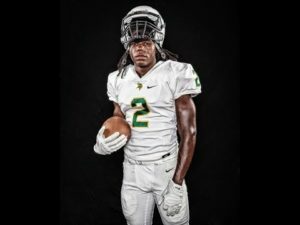 I’ll ask directly, again…is this the best RB prospect that we’re going to have a good shot at in the whole recruiting cycle? We’re not recruiting on their level. That’s why they’re elite teams. They’re going to have higher rated players unless/until something bad happens (sanctions, Saban retires, Meyer has health problems, etc. )…OR unless we start beating those teams consistently with lower rated players. You saw this with Najee Harris. Taking Turner now doesn’t prevent us from getting a more elite back. I addressed that in the post. Your comments contain several incorrect assumptions. The grumpy fan The grumpy fan The grumpy fan. 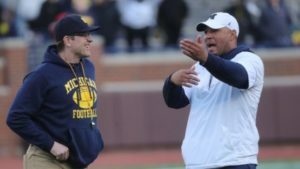 And as usual, the mgoblog fanboys are incapable of actually discussing football, and instead start right off flinging playground insults, which they tell each other are incredibly clever and add so much to the discussion. Sorry if anything that isn’t gushing praise for the Michigan football program gets your undies in a knot. Harbaugh is not god. You should just back away from the keyboard there whiney. Every time you touch that thing you reveal yourself and lose respect. Hey WCB. 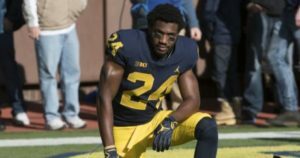 I am not a mgoblog fanboy, and I do not always disagree with you. In fact, without the insults you can offer a reasonable dissenting opinion. Last year I did not think extending an offer to Taylor was the best use of a RB scholarship, Turner shows me more. Christian Turner’s highlight reel I saw didn’t include much info on his ability to catch the ball or in pass pro, but his running is not too shabby. 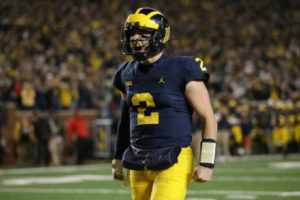 In fact, several knowledgeable people that I respect have commented on his ability to run inside zone and find this indicative of Michigan’s intention to spread things out a little more. Sometimes you just have to defer to folks actually running our recruiting board. Michigan needs to recruit better to reach being a top 5 program. Getting a RB with an impressive offer list is the least of our concerns in that regard. The OL recruiting has been deficient. They have missed on every blue chip corner they’ve tried to get. WR and LB recruiting have been excellent under Harbaugh. DL has been really really good with Mattison continuing to do his thing. TE looks pretty good with Asiasi/Wheatley but will see what happens. RB is TBD, but Chris Evans looks like a star. There are areas for improvement. Turner doesn’t sound like he’s a guy we should be jumping up and down about, but he’s also not the kind of late-in-cycle offer that should be viewed as a defeat. Made me think a little of Gordy Bell … only taller, not as thick in the legs. I thought his reel demonstrates some exceptional vision and really good quickness and smarts to go along with some very unexceptional speed. Alas, nobody’s perfect. 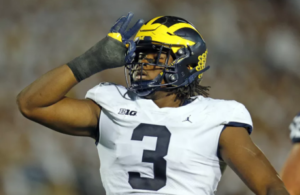 Maybe Rashan Gary. I particularly liked the first play where he sees himself surrounded, takes an angle in order to bring help and then cuts behind blocking to the goal line. You’re not coaching that one into a kid. It’s either in there or it ain’t. I don’t dislike or like the ranking. I have no idea how I feel about this kid, but I’m happy with his commitment. When watching his tape, he shows some flashes of athleticism, but I don’t know if that’s him or the competition. I think the opening will shed a little light on that. I like his balance, but I don’t like it as much as Deveon Smith’s at the same point in their careers. 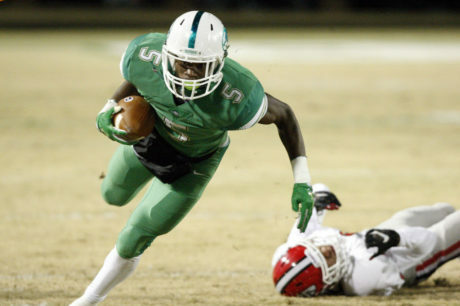 Deveon’s balance was insane in his high school tape, and my favorite part of his game. Turner shows pretty insane balance throughout his highlights, but a good example is right around 0:40. There are times I think his vision is above average (2:58 for reference), but then rewatching a few of them, it looks like that was the only route to take (2:36 or 7:15). I trust Harbaugh, and Turner’s offer list is lengthy with some pretty solid offers in there, like Wisco and ND. 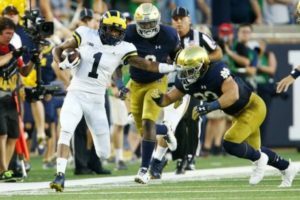 Michigan continues to focus on smaller shiftier backs. This is wise. Death to jumbo-backs. I give this recruit a ‘Meh +’ rating. Seems to have upside, will be serviceable… But at some point we absolutely have to land a dynamic playmaker. I have to chime in because I almost always comment after a commitment. I like to keep tabs on my assessments. My evaluation is somewhat mixed. I love his shiftiness and vision. I’m not thrilled about his speed or lack of film in the passing game. I totally agree with the rating and think he will be highly serviceable. However, if you’re looking at 1 RB for this class I hope they still have their sights on a couple other recruits with the hope of landing another. I’m not a believer (like LK) that RB’s are interchangeable in the college game. In fact, I see it as just the opposite. I don’t believe NFL teams should draft RB’s in the 1st rd (mainly due to overuse and longevity), however, I think a great RB can make a huge difference in the college game. Of course a great Oline will help but spectacular RBs will break 1 tackle and take it 80 yds while the avg RB gets tripped up for the 5 yd gain. Same size hole, different results based on 1 players talents. I appreciate the distinction between the NFL and college and I think there is useful point there, but that’s because of the greater parity. If we’re talking about the games that matter – the ones against peers or wanna-be peers like OSU, ND, MSU, Florida, Florida State, etc – then you start having equivalent category. I think there are exceptions to the rule, but the difference-making backs are pretty rare. Why do I say this? Because there aren’t many backs that are really missed when they are replaced for the top tier schools. A guy goes down, he is replaced by another guy who is 95% as good. This happens again and again. So yeah, there are some guys like Saquan Barkley, or Leveon Bell, or Dalvon Cook, or Darren Sproles who are legit difference makers, but there are maybe one or two of them in a class. Most of the rest of the guys that power conference teams are getting are interchangeable. Not identical, but in the same general range of ability to influence game outcomes. I can’t prove this other than to point to how teams do when their backups come in, how bad they are missed after graduating, and how well they do at the college level. If a guy is an NFL dud and did great in college is it really about how he played? Or is that he had a great running team around him? With Michigan RBs of the vintage 80s, 90s, and early 00s teams — it’s pretty clear it was mostly about the OL. (See number of all-pros and hall of famers at RB vs OL). And looking at it form the perspective of a college team – typically there isn’t much drop at, for example, Wisconsin or Alabama. Even though they have guys getting drafted really high – generally without great success at the NFL level. Maybe it’s a “great eye for talent” at RB. The NFL results would indicate that’s not really it. Maybe Chris Evans is that guy for Michigan. He’s the first one who has looked like he might be as a freshman since I don’t know who. It sort of depends on how good you think Deveon Smith was and how much you think our OL held guys back. Most likely he’s just another interchangeable guy…but there’s a chance he’s something special. I would say the relative lack of OMG HYPE coming on Evans indicates that he’s probably not going to be one of those true difference-makers. Doesn’t mean he won’t be a heisman contender IF the rest of the offense is going full-steam ahead.